Fig. 13. GH responses to an acute intranasal dose of GHRP-2, 1 ¡¡g/kg on initial testing and 6 mo after daily GHRP-2 administration in children with GH insufficiency. Initial testing, n = 12, + 6 mo, n = 9. Mean ± SEM. Reproduced with permission from ref. 72. 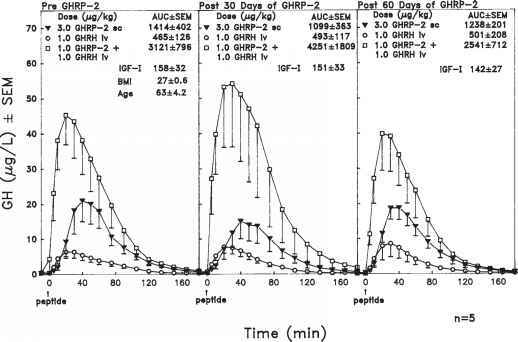 Results of the GH responses to GHRP-2 or GHRP-2+GHRH during chronic administration to normal older subjects every other day for 60 d are recorded in Figs. 14 and 15 (77). The acute GH response to GHRP-2, GHRH, or GHRP-2+GHRH was not differentially influenced by GHRP-2 alone or GHRP-2+GHRH administered chronically. Neither GHRP-2 nor GHRP-2+GHRH desensitized or up-regulated the acute GH response to GHRP-2 or GHRH. 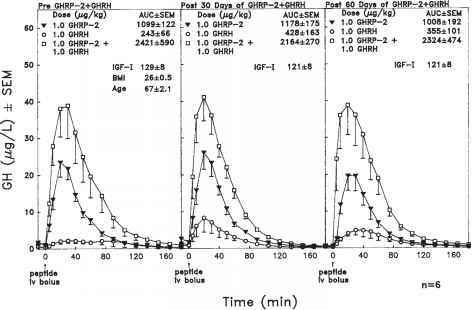 In these studies, serum IGF-I levels remained unchanged during chronic administration of GHRP-2 as well as GHRP-2+GHRH. Although demonstration of a decreased GH response to 1 ¡g/kg iv bolus GHRH is essential for understanding the pathophysiology and for making the diagnosis of pathological secretion of GH in older men and women, the GHRH response alone is considered insufficient for these two purposes. Almost all normal elderly men and women have considerably lower GH responses to 1 ¡g/kg GHRH than normal younger men and women and therefore, utilization of this criteria alone would tend to include all normal elderly subjects. The results of age-dependency of GH release are recorded in Figs. 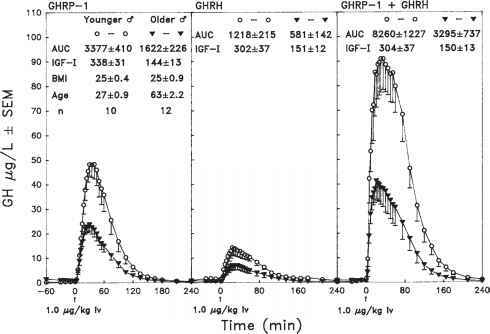 10 and 11 for GHRP-2 with and without GHRH (68) and Fig. 16 for GHRP-1 with and without GHRH after iv bolus administration of the peptides (78). 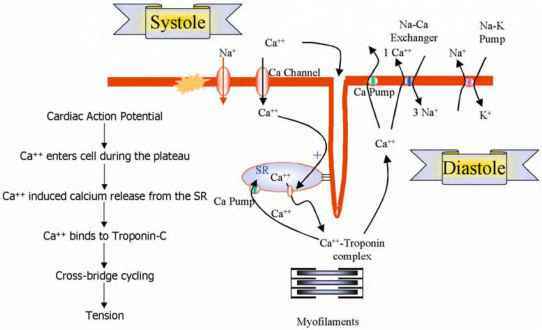 Furthermore, the GHRH approach alone would not distinguish a low response due to excess secretion or action of SRIF. Particularly needed is a new approach based on a better understanding of the patho-physiology in order to distinguish the decreased secretion of GH associated with aging per se from a pathological decreased secretion of GH due to a possible specific hormonal deficiency. As unlikely and illogical as this may seem at first, the putative GHRP-like hormone and GHRP-2 appear intimately and perhaps fundamentally related to the pathophysiology and to the diagnosis of the pathological decreased GH secretion in the elderly. Fig. 14. Effect of 3 ^g/kg GHRP-2 sc every other day in the AM for 60 d in normal older adults. The GH responses to iv bolus GHRP-2, GHRH, and GHRP-2+GHRH were the same before treatment, at +30 d, and at +60 d. The IGF-I mean levels did not change. Fig. 15. Effect of 1 ^g/kg GHRP-2+GHRH every other day in the AM for 60 d in normal older adults. The GH responses to iv bolus GHRP-2, GHRH, and GHRP-2+GHRH were the same before treatment, at+30 d, and at +60 d. The IGF-I mean levels before and after treatment were unchanged. Fig. 16. Comparative mean GH responses to GHRP-1, GHRH and GHRP-1+GHRH in normal younger and older men. Values are the mean ± SEM. Reproduced with permission from ref. 27. Bercu and Walker (79) have performed a series of studies in animals and humans in order to understand the pathophysiology of decreased GH secretion that occurs during aging and also to develop an approach to diagnose this endocrine abnormality(s). In order to understand this pathophysiology and to develop a way to distinguish the decreased GH secretion due to normal aging from that due to a pathological abnormality in older men and women, our approach has been to assess and establish the clinical value of a dual linked index of GH release designated a quantitative GH release index and a qualitative GH release index. Our hypothesis is that the pathophysiology of the pathological decreased GH secretion in older men and women is due to a deficiency of the putative hypothalamic GHRP-like hormone rather than a primary deficiency of GHRH or an excess of SRIF. The basic finding that has led to this hypothesis is that the pituitary action of 1 ^g/kg GHRH on GH release is quantitatively impaired and that this impairment is reversed by iv bolus 0.1 ^g/kg GHRP-2 + 1 ^g/kg GHRH (80,81). An example of these GH responses in a normal older woman is recorded in Table 7. Also in Fig. 17 is recorded the results of an acute GH response of this same older woman before and during twice daily 0.1 ^g/kg sc GHRP-2 chronically for 30 d. Noteworthy is that 0.1 ^g/kg GHRP-2 consistently and dramatically reversed the markedly impaired GH responses of 1 ^g/kg GHRH on d 0, 15, and 30. This supports that the impaired action of GHRH on GH release is basically and primarily a hypothalamic rather than a pituitary pathological abnormality.